With this player you no longer have to bring your precious CD into your car, truck, van, coach, bus, boat, plane, ... or to worry about scratched, lost or stolen CD's. With the simple USB interface you can update audio files quickly. There is no need to rewind or to load and unload K7 or discs to go from Beethoven to Miles Davis, you've got everything at hand behind the wheel. 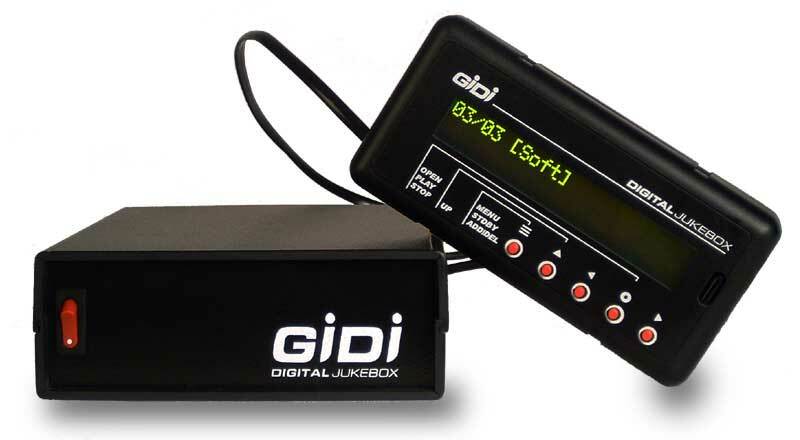 Using the latest advances in hardware and software technology, the GIDI Pro jukebox allows you to store and to listen to over weeks of high quality stereo music. Do not mistake this for one of the MP3 players which hold a maximum of two CD's worth of music, Imagine, no need to choose which CD's you want to store as you can store your whole CD collection, no need to pack an extra bag of music equipment when you go on vacation, or at a "Barbq party". There is enough space for about 400 CD's in our smallest device and up to 2.500 CD's in the biggest one (120GB) all with CD quality compression. The GIDI Pro jukebox is provided with everything to get started, it is even provided with a free pre-loaded music sampler so you can enjoy it as soon as you get it. Easy to use and set up with your personal computer, Once connected to your computer, you can start loading your own MP3's immediately, you do not need any special software, you just have to create files in the GIDI as you do with your computer and then, drag and drop MP3 files to the GIDI ! Has audio outputs on standard 3.5mm jack and standard RCA "chinch"
Just think about the road while listening to the music you really appreciate). Just move the hard-disk from screen to screen (remember, GIDI MicroServer is also an external USB hard-disk). Optional device - It has the same functionalities as the other ones but the use of digits gives you Direct Access to your choice (GidiDexr software enables you to print a guide list with an automatic numbering of your whole GIDI Hard-Disk). Optional device - It has the same functionalities as the previous RC via 5 main buttons and has the same buttons as the GIDI separate DISPLAY front panel ones (also used as a cabled Screen Remote Control). You may use a Palm device (or compatible Palm OS as HandSpring/Visor), to manage your GIDI as a Remote Control Mini (5 big buttons on your screen), or as the Remote Control with digits (Direct Access), and use our GidiDexr software to display all your songs/artists. You can also search and find your desired specific titles among others (e.g. writing "MAD" in search field gives you all of Madness titles then Madonna ... and so on). A serial port adapter is required ! Music/Song/Speech server : GIDI could be used via a network connection as well. You may order our optional "Serial Port" device (to be connected in place of GIDI Display slot). House Automation : for use with a House Automation system (e.g. CRESTRON), GIDI will be a slave, House Automation display/screen will allow you to navigate through archives and menu (as well as GIDI front panel). Kiosk Applications : use a GIDI MS Box of your own case/design with external management through this Serial Port.